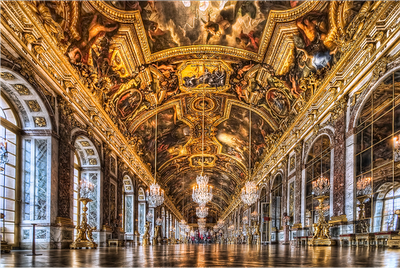 The Treaty of Versailles was named for the palace it was signed in. You begin your look at 20th century Europe at the end of World War I. You'll be learning about World War II at the end, but before you do that you must understand what caused it to happen in the first place. Well, the first seeds of WWII were sown in 1918 when WWI ended. World War I broke out after years of suspicion across Europe. Britain and Germany each built up their armies and navies, both wanting to out-do the other. Alliances were made across Europe, with larger countries promising to defend smaller countries if they were invaded. A war was going to break out eventually, but the fuse was finally lit in 1914 when the Austrian Archduke Franz Ferdinand was shot dead by a Bosnian-Serb group of assassins. As a result, Austria-Hungary declared war on Serbia, Russia declared war on Austria-Hungary, Germany declared war on Russia, France declared war on Germany, and Germany invaded Belgium in order to attack France... so Britain declared war on Germany. The "Great War" was expected to be over "over by Christmas" (Europe was used to wars at this point), but it ended up going on for four years. Britain, France, Germany and Russia had colonies all over the world which also fought each other, and in 1917 the United States joined in, which is why the war is known as the "First World War". 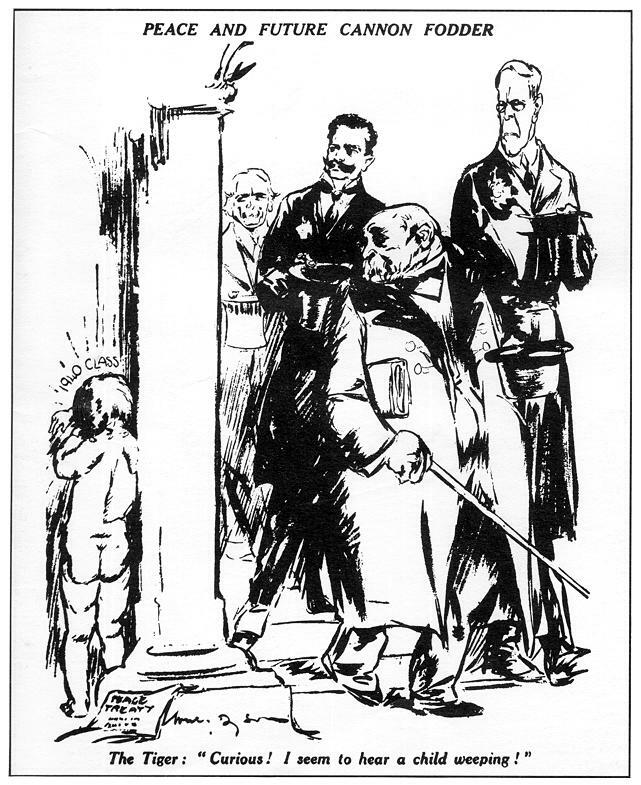 Wilson, Lloyd George and Clemenceau: what did they each want? 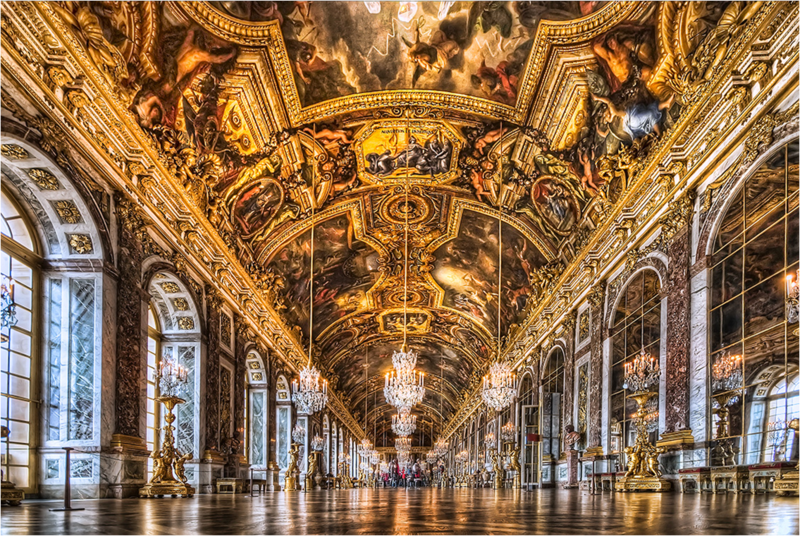 The Treaty of Versailles: terms and conditions, Germany's reaction. The League of Nations: set-up, successes, how it failed. Europe in 1914. Important countries are named. This website has hundreds of images from the war, and details on every key figure, event and battle which took place. The White House's biography of America's 28th President (who was first elected 100 years ago this year). The 10 Downing Street website has a biography of David Lloyd George. The History Learning Site has a page on the French leader nicknamed "the Tiger". The same site has an overview of the treaty and what it meant for Germany and for Europe. Here are some of the key clauses from the Versailles Treaty. A summary of the League of Nations and Germany after the Treaty. 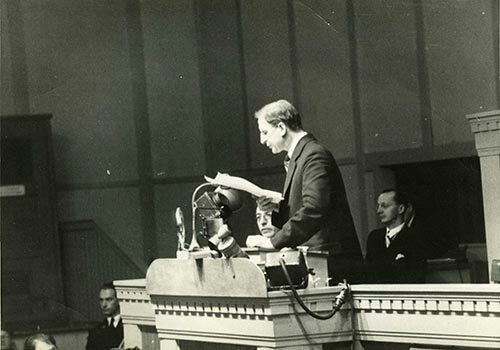 The League's successor, the United Nations, has a little piece on its history. Another overview from the HLS. The leaders of League countries would each be afforded leadership of the League's Assembly for a year. Irish Taoiseach Éamon de Valera was leader from 1938 to 1939, the year World War II began. By now, the League was deemed a complete failure, and de Valera's speech addresses this. The Tiger: "Curious! I seem to hear a child weeping!" 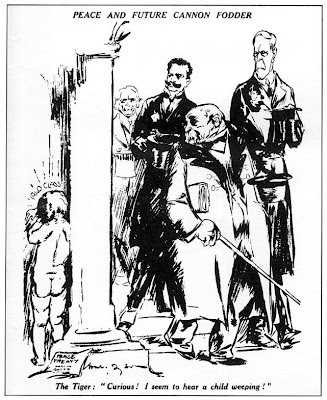 This cartoon is from 1919, just after the peace conference. The child is labelled "1940 class". What age would children born in 1919 be in 1940? What do you think this cartoon means? An excellent hour long documentary on the personalities and motives of Woodrow Wilson, David Lloyd George and Georges Clemenceau, the three world leaders who took centre stage at the negotiations for the Treaty of Versailles. Watch and see what they initially set out to do, and how they all had to compromise in the end while trying to solve a problem "that we are still struggling with today".